I’m for hand made. I’m also for sanity. And reality. 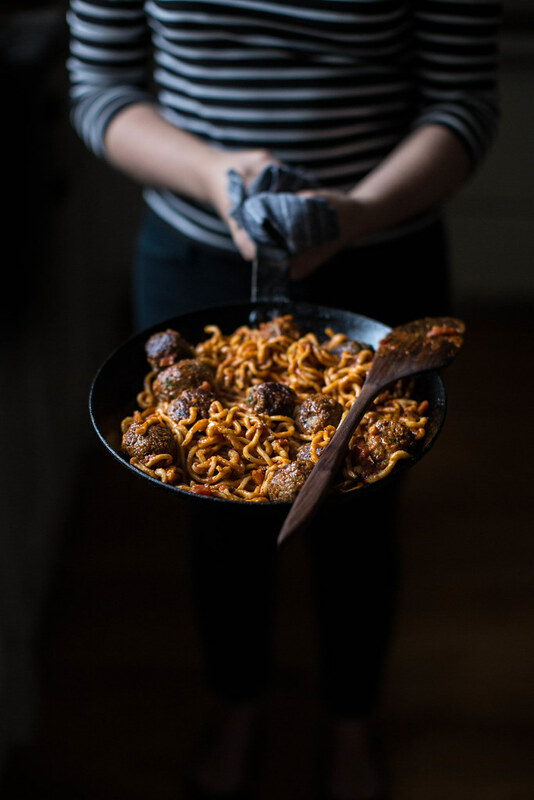 I have lots of fantasies, and some of them involve having afternoons that dapple endlessly during which I roll out pasta like a nonna & sauce bubbles away on the simmer plate all day long. Others involve me living in a cottage in the Burren studying the physics and metaphysics of the herbs that populate the hedge. And yet others involve me being the sort of woman who still wears high heels, lots of lipstick, and extraordinarily complicated lingerie. Alas, my real life is not comprised of such things. Well, not usually. Not these days anyhow. But that doesn’t mean that bits & pieces of those other lives can’t mingle with my real one. I can wear red lipstick and make meatballs & pasta from scratch with a cup of herbal tea brought back from Ireland to fuel me. And I’m never above reaching for a solid jar of great tomato sauce (most especially when tomatoes aren’t in season), namely this jar of Bertolli’s new Gold Label Imported Porcini & White Truffle Sauce that the nice folks over there sent for me to try out. And try out I did, over and over. It’s earthy, rich, and pulls this whole dish together effortlessly. The best part is it allowed me the time to dote over the tactile pleasures of the hand made pasta & meatballs that I’m making for a little Italian themed supper as part of the #BertolliGoldLabel Italian Progressive Dinner Party. I am, as you see, doing the pasti course in the progressive dinner party. The meal wouldn’t be complete without checking out my fellow bloggers recipes in the menu: you can find a gorgeous antipasti of mushroom polenta bites on Shutterbean and a primi of Carmelized Onion Stuffed Portobellos on Dine & Dish for the first portion of the progressive dinner party menu. 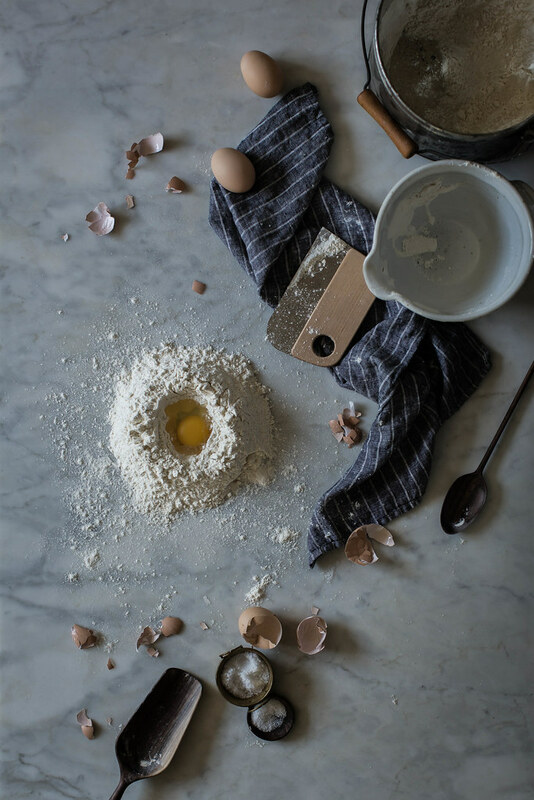 And head over to Oh Sweet Basil tomorrow for a secondi, and don’t miss the all important dolci course from A Cozy Kitchen on November 7th! 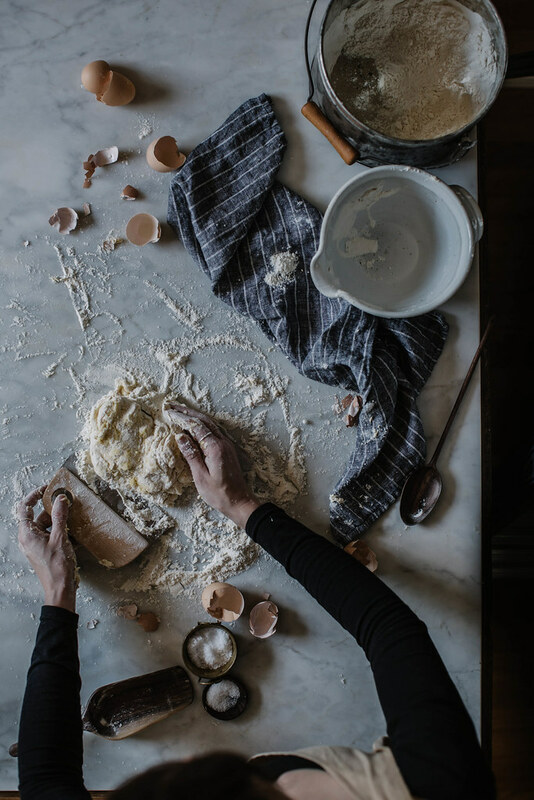 We’re making all the foods, and you can keep up with where we’re at in the progression and find links to my fellow hosts recipes on Bertolli’s Facebook and Twitter pages as well. If I tried to do it all, most days, a pile of deadlines would crash unceremoniously on my head. This way I can have my pasta & eat it too. Some days, I go for a box of good dried pasta & simmer a sauce. Some days I do it all. Some days, I do none. 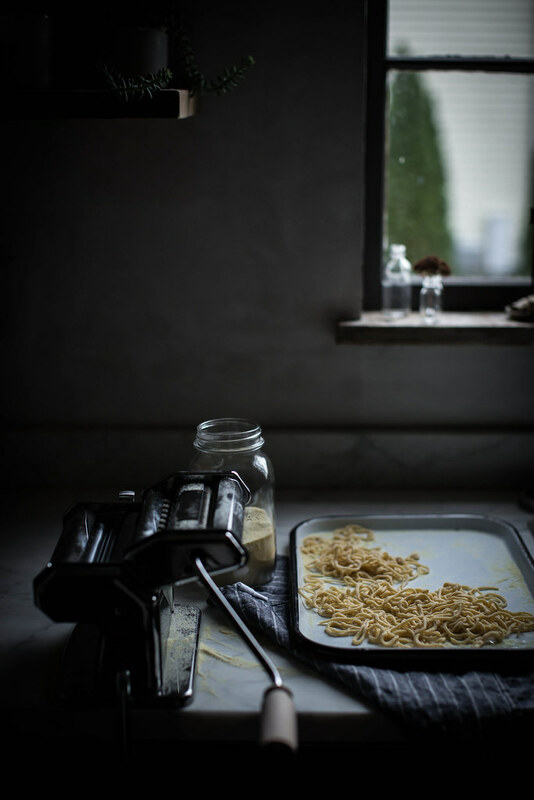 Today, let’s make pasta from scratch (which, if you have kids, is especially fun!) And the best meatballs you will, dare I say, ever eat. Make them. Please. Do that for yourself. I have seriously never cared about a meatball like I do these. They’re incredibly moist and full of flavor. 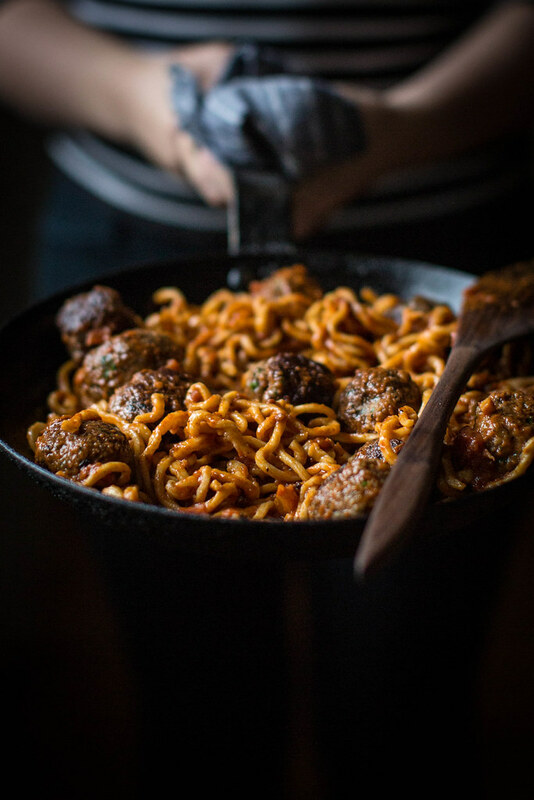 All three together—the pasta, meatballs, and the Bertolli Gold Label Porcini Sauce–were enough to make me care about something as seemingly common as spaghetti and meatballs. Which is saying a lot for a novelty seeker such as myself. I can’t wait to serve this at the party! The looks on my friends’ faces when they try the food, that’s what I’m really in it for. Well, that and eating it. First, make the pasta. 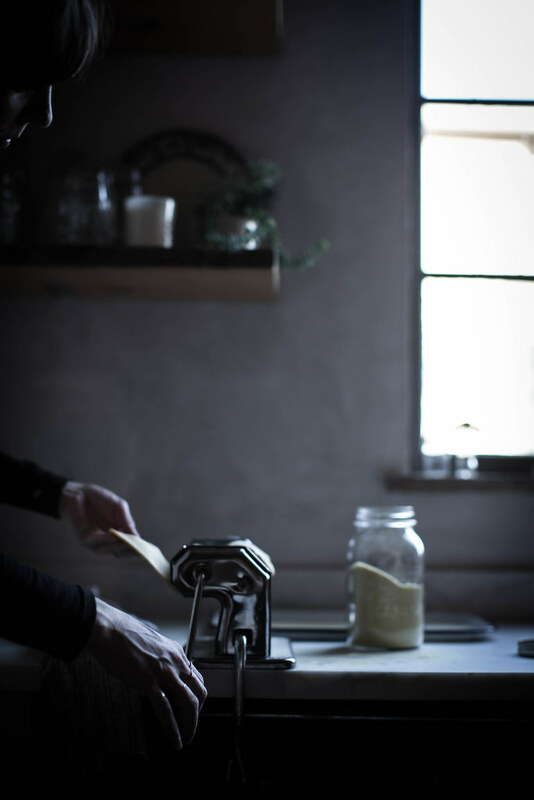 In a bowl or on a clean work surface, form a well in your flour. Crack the eggs into the well. Stirring them with your finger, slowly incorporate flour from the sides. 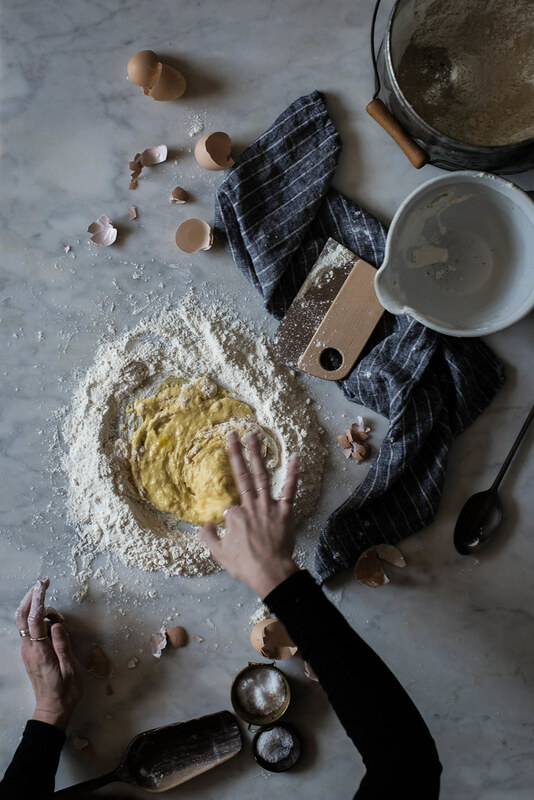 Once most of the flour is incorporated and it starts to get crumbly turn it out onto the work surface (if using a bowl) and start to knead, using a bench scraper to pull it together. It will start to come together and form a smooth, elastic ball. If it feels a bit dry, wet your hands and work it some more. If it's sticky, dust the surface with flour and work it in. It should be smooth, pliable, and velvety. 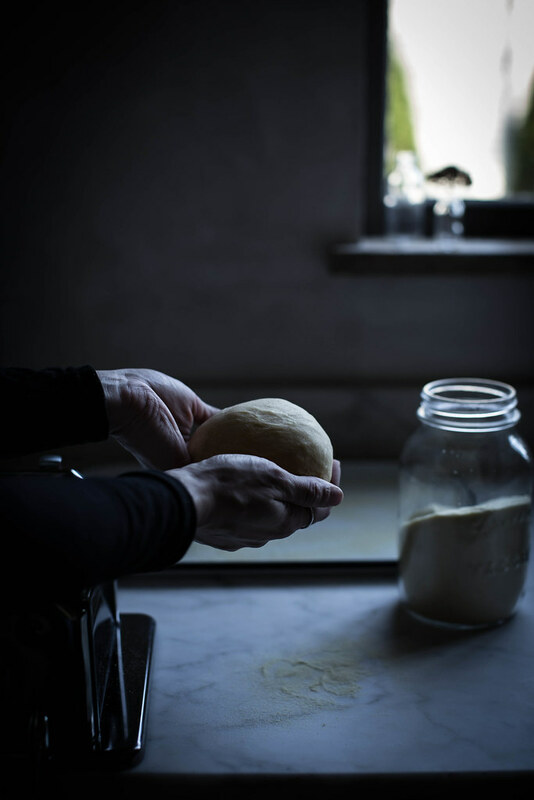 When you press the ball of dough with your finger and it bounces back, you're ready to wrap it up in plastic wrap and give it a good rest, about an hour. 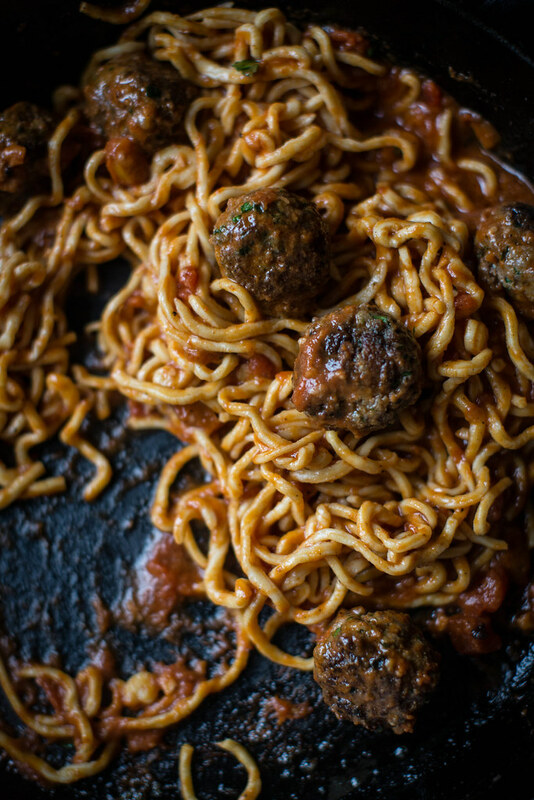 While the pasta rests, make your meatballs. 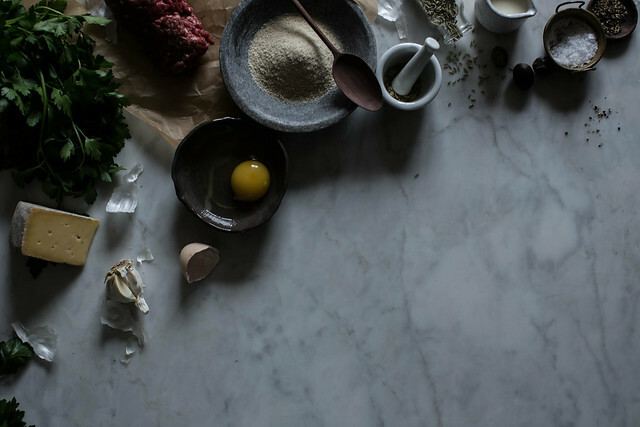 Line a tray with parchment paper. In a mixing bowl combine all of the ingredients for the meatballs except the olive oil for frying. Using your hands, gently mix it all to evenly combine. 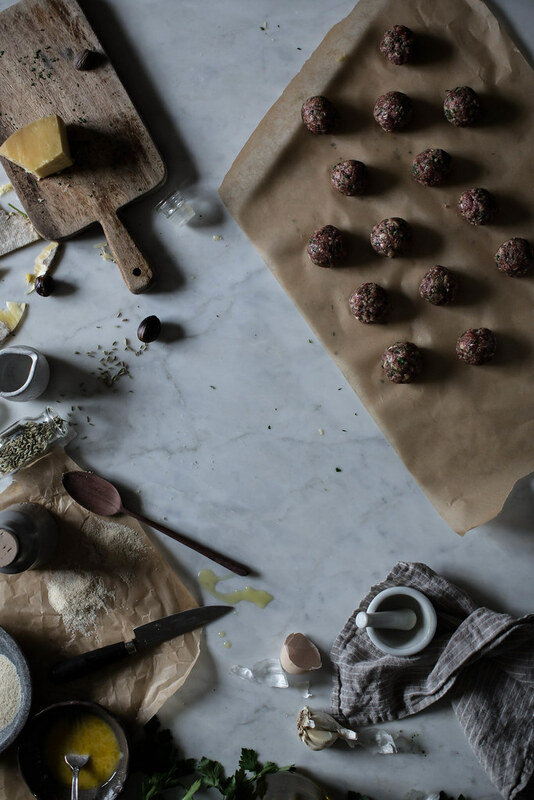 Wash your hands, coat them lightly with oil, and gently roll the mixture into golf ball sized balls, lining them on the parchment as you work. Cover with plastic and chill until ready to fry. Roll out your pasta into spaghetti according to the manufacturer's instructions on your pasta roller. I usually roll my dough 2-3 times on the widest #1 setting before passing it through the narrower settings. For spaghetti I roll it to a #4 or #5 on my machine before cutting in the attachment depending on how thick I want it. Toss with semolina on a sheet tray to prevent sticking. Now it's time to fry our meatballs. In a skillet large enough to fit them all without crowding (if you don't have one, just do them in two batches like I do) heat olive oil until shimmering over medium high heat. Brown the meatballs on all sides. This is critical to their wonderful flavor and should take about 7-10 minutes total. 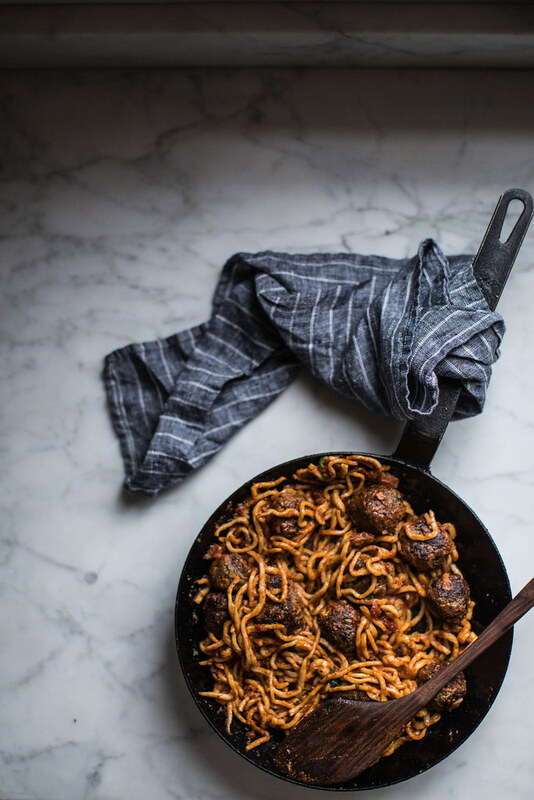 Once all the meatballs are brown, pour the jar of sauce into the skillet, and simmer it all over medium low while you cook your pasta. Bring a large pot of salted water to a boil. Put the fresh pasta in the water and cook until just al dente, about 5-7 minutes. Drain the pasta and then toss it in the pan with the meatballs and sauce. I usually run a pair of kitchen shears through the spaghetti to make it more tossable and less tangly. Once it's all tossed together, sprinkle with a bit of parsley and cheese over the top and serve it with tongs hot from the pan! And a big thank you to Bertolli for including me in their progressive dinner party & sponsoring this post! I was compensated for my recipe & photographs, but my opinions (and addiction to this sauce) are, as per usual, all my own. 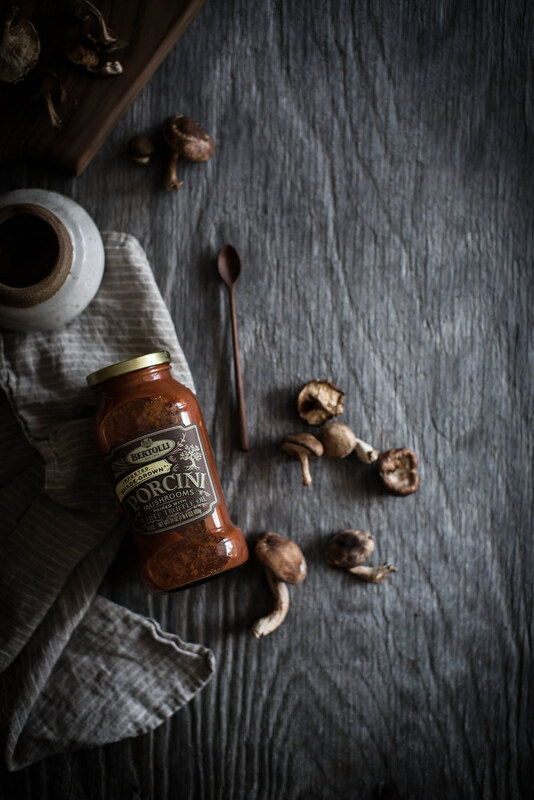 I hope you enjoyed the recipe, and feel free to follow along with #BertolliGoldLabel to see what’s next on our collective menu! rich light like in your photos should be reserved for rich dishes, and this looks utterly fantastic. love the insertion of bison, i never hesitate to swap for it when I can. and that sauce sound great, go bertolli go! Pasta from scratch is something I always wanted to do. 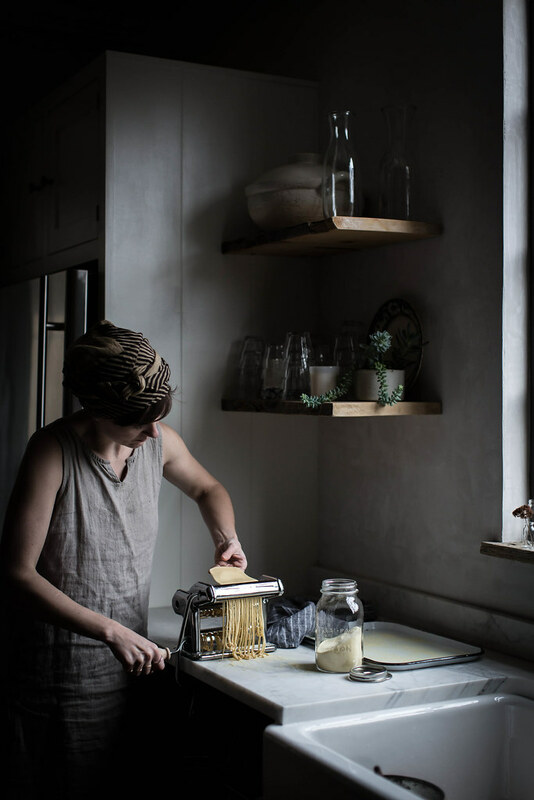 The pasta machine is on my list to buy. But still, I’m going for your meatballs. People have strange fears, right? I’m afraid of inexplicabel stuff such as clowns, bugs and… dough. I am actively trying to overcome my fear of dough, of having my hands seeped into dough as I mix the ingredients that comprise it. First step was a batch of almond infused scones I baked this week. There were tears brimming in my eyes as I put my hand to said ingredients and mixed them together. But I persevered, because with scones, you are not meant to liger on with the dough, just a quick mix and a quick roll and then you cut them and you bake them and you eat them piping hot and with melting btter, or quince marmalade because I’m portuguese and sometimes rather obviously so. It was a start, those scones. 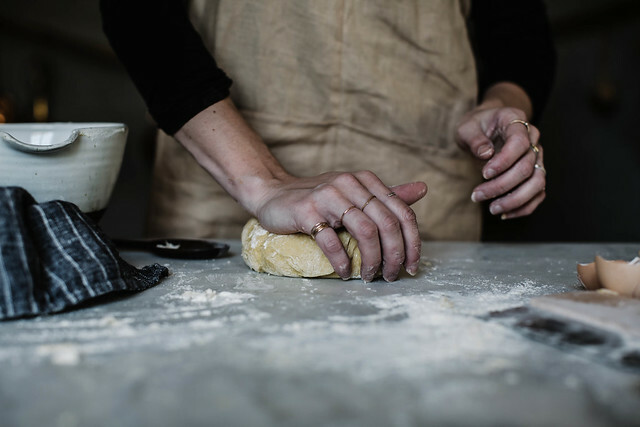 THh main reason for me deciding to face ths fear/disgust of having my hands in dough is my love for italian food, namely for pasta, and my lovely for good ol’ brittish food, namely pies. 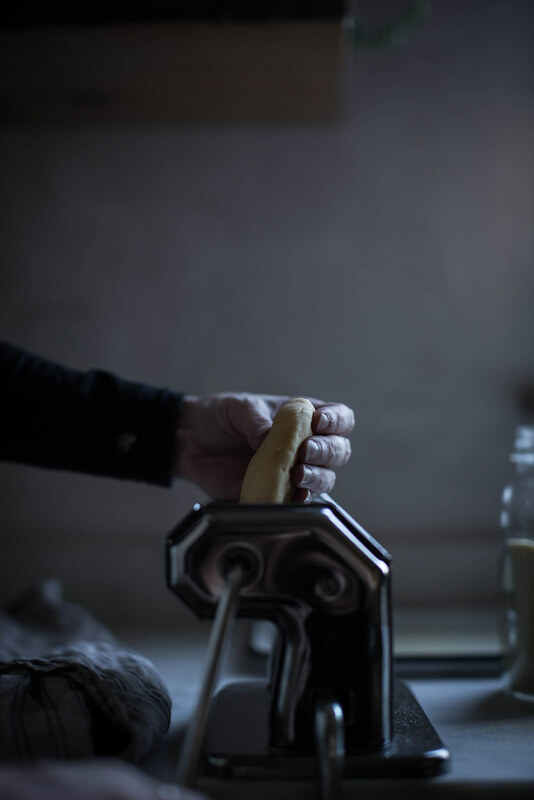 I usually rely on my husband to do the doughs, the batters, anything that is gooey and requires hands on approaches to the gooeyness, but hey, the man works full time, I’m a homemaker, so if I fancy somink, I might just as well cook it my bloody self, right? All this to say that I have been craving spaghetti meatballs a loooot lately. With homemade pasta (innit strange that the making of the meatballs with my bare hands does not disgust nor send me into bouts of fear induced anxiety as the pasta does?) and all. I have been putting myself into a state of mind where I can just force myself to tackle that pasta single handed, and wasn’t it a good – yummy – coincidence coming here and see this? I want this for lunch and for dinner today! Sadly, bison. Cannot get my hands on that type of meat. WIll dream of it for sure, as I dreamt of deer meat for years until I finaly had it. But I can use other meats, and I can make the pasta. At least I can try to make the pasta, and if husband’s not at home, son will help if I get a panick attack! !He adores making pasta from scratch, so there. And the sauce, I am already planning on how to replicate that tomato sauce, you know? Or at least to get near enough to a tomato mushroom sauce… oh I’ve made myself so hungry, now!! We make pasta all the time and love making it. Your recipe looks delicious and I haven’t tried the Bertolli sauces. We really like another brand that is pricey and we wait until it goes on sale but the Bertolli is on my list to try. 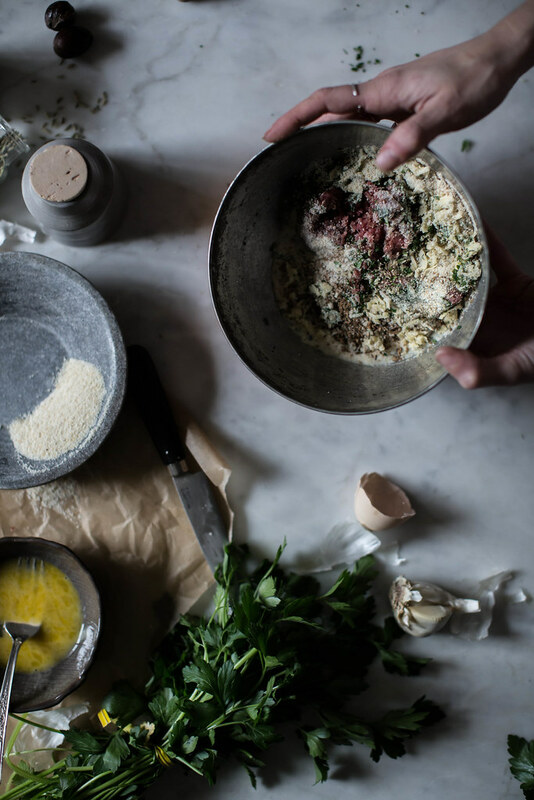 We love making wild mushroom ravioli. Yummy!! I bet it would taste fantastic. BTW did you have a remote shutter release to get the awesome picture of you holding the cast iron pan?? This looks so delicious, Beth! You make me want to eat spaghetti right now! (even if it is 7:30 in the morning) Thanks for sharing! Will have to try sometime. Spaghetti never got me all tangled up in excitement, either. But this does look fun. After school project! Pronto! Oh my goodness… I am so in awe of your talent. What a beautiful post! your photos are EXCEPTIONAL!! Wow! Lovely!!! I’ve never tried working with bison before – maybe it’s about time. Beautiful photography. this looks so delicious I need to try this ASAP! hopefully I can buy bison here in vienna.. This looks amazing! I looks like such a hearty comfort food but it’s also so original! I will definitely be trying it and this has definitely made me decide to try to post more meals! 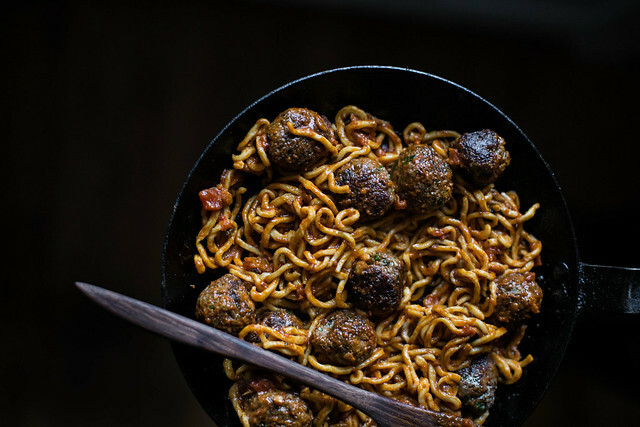 I love meatballs and these look so good! I can really relate to the feeling of wanting to be a little bit more like this and that. Though I’m actually pretty happy with being just me. Best pasta of life. I don’t eat gluten of meat, but if I did, I would be all over this. And your photos just slay me. Wow. Nice recipe and beautiful pics as always. Just a question: why are you using Kosher salt instead of regulas salt? I have been quite intrigued to buy some of that sauce and pretty sure this post gave me the extra shove to do so. Italian food is my absolute fave. Fantastic, everything is fantastic. The recipes and the pictures. Congratulations to this outstanding blog! hi. should i add 1 cup of parmesan to the minced meat? or it should be used for serving pasta at the end? It should be added to the meat! I so agree with the feeling to do things homemade and wear red lipstick, gorgeous photos. I’ve said it once, I’ll say it again- I stop by to get some inspiration both, when it comes to food and the photography. I never leave disappointed! It’s magical how you can capture the moment in the pictures. Bison is great for strong flavors, lean and gamey. Beautiful pictures, as always! There is nothing like homemade pasta and the way you bring it to life is outstanding! Beth, wow! Your work is absolutely stunning! Beautiful words and photos. I am a newbie blogger and a follower of Local Milk. You are inspiring. 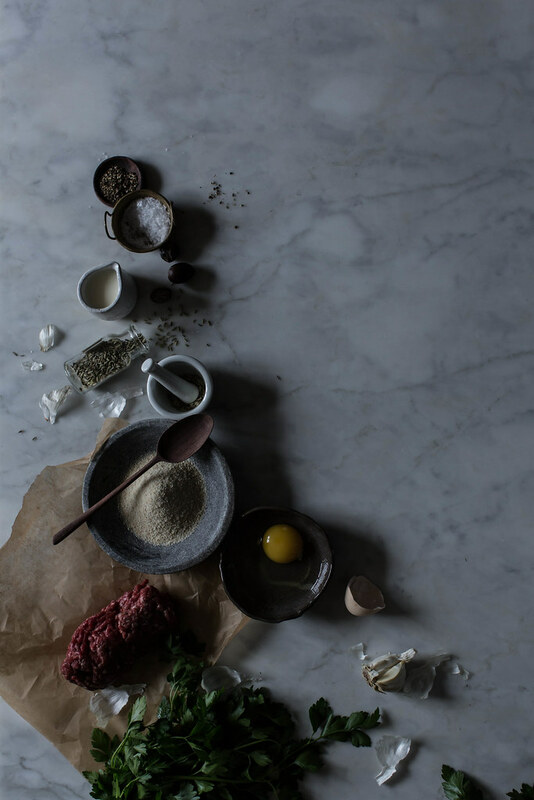 Beautiful photos and yummy food. 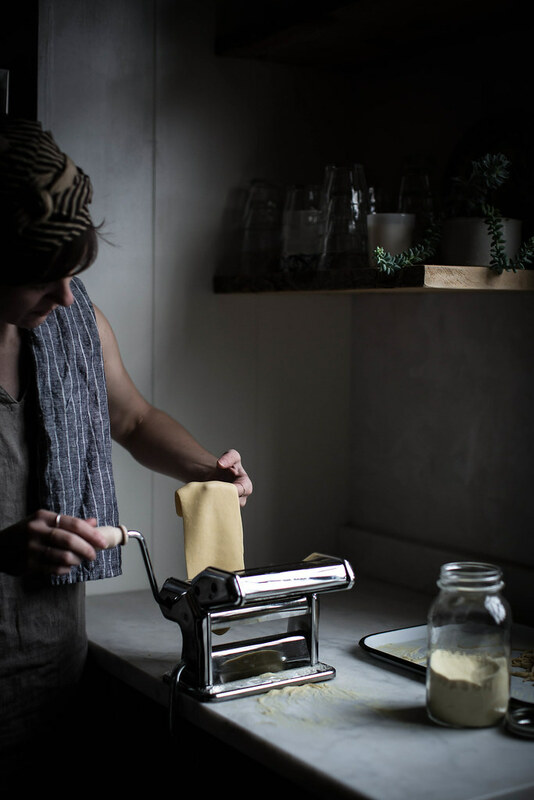 Wondering what model pasta machine you use? Thanks! Homemade pasta is such a treat! Love this dish, Beth. I too, often add fennel seeds to meatballs. They give the right zing. Can’t wait to try your version! wow so happy i stumbled upon your blog! every thing looks so amazing! Such a wonderful, heartwarming and comforting dish. Thank you for sharing your beautiful work. I’m always impressed with the recipes and pictures. It’s truly inspiring!